I just returned from a week in the Boundary Waters Canoe Area wilderness that my son said is my natural element. He may be right for there are places there I have known better and longer than any other places on this earth. Along the way I stopped to see two old friends who had given me my first job while I was still in college. The conversation turned, as it often has, to those days when they bought a boy's camp in their late twenties with no experience running a camp or even working in one. All they brought to the job was a commitment to make a difference in the lives of young men. Over the years they attracted a high-quality staff and nurtured a generation of boys who went on to become astronauts, professional athletes, university professors, artists, doctors, lawyers, researchers, technology experts, and a fair number of managers and consultants. On the drive home I thought about their experience and its relevance to this Presidential election. No matter which candidate enters the White House next year, he will be walking into a job for which he has no prior experience. Regardless of opinions to the contrary, no one is truly prepared for the responsibilities and complexities of the modern American Presidency. In fact, as historians have pointed out, some of those who supposedly rank among the most qualified turned out to have some of the more controversial and least successful administrations--Herbert Hoover, William Howard Taft, John Quincy Adams. At the same time some of the least-prepared rose to greatness or near greatness--Abraham Lincoln, Woodrow Wilson, John Kennedy, Harry Truman. What enabled my friends and former bosses to be so successful even though they were young and inexperienced can be summed up in one often-over-used word--character. Their camp was all about values, When I look back on it values were everywhere. The camp was like a fabric woven from them. It was this focus on values that enabled them to make decisions about critical issues that no one--not even they could have anticipated. It also enabled the camp to have a center--what I have often referred to on this blog as a moral compass--so that each of us was on the same page and all our actions reflected those values. Many other wilderness camps around ours had some serious incidents. One ended up closing because of a drowning. Another lost two young men on a survival outing. A third lost two counselors who stupidly took an aluminum canoe out into a thunderstorm. It's not that we did not have accidents or everything was perfect, but because of that moral compass the accidents were not fatal or even life-threatening. This may seem simple, but when you send groups out into the wilderness, potential accidents are everywhere. On trips I took out one boy put a knife through his hand far from a hospital. Another accidentally poured a pot of boiling water on his leg. A third managed to accidentally bump a canoe sitting at a portage landing and send it careening down a set of dangerous rapids. Normally I don't get too personal in these blog essays, but I relate these stories because they are metaphors for situations faced by Presidents. The observation about the primacy of character also holds true for Presidents, as confirmed by some of our most imminent Presidential and leadership scholars. James MacGregor Burns and Bernard Bass, the first who coined the term transformational leadership and the second who helped to define its qualities, both see character in the form of principles and values as the heart of transformational leadership. End-values such as liberty, justice, equality. Authentic transformational leaders, who may have just as much need for power as pseudo-transformational leaders, channel the need in socially constructive ways into the service of others. The Counterrevolution already seems to have honed in on what will be the theme for their campaign against Barack Obama. Borrowing from Hillary Clinton, they will seek to attack his youth, his inexperience, even his naive views of policy and human nature in a campaign whose template could be 1960. This theme emerged during the recent Obama world tour, most notably in John McCain's remarks about Obama's Berlin speech, which by all accounts from personal sources in Germany was well-received. Whether Barack Obama has the character it takes to become President is still an open question as it also is with McCain. But I can predict this campaign will revolve around it, in part because the incumbent has exhibited a considerable lack of it. Looking back on the lives of Lincoln or Kennedy, hindsight now reveals flashes of character in their pre-Presidential years, but at the time those seemed less evident than they do through the lens of hindsight. No man ever before made such an impression on his first appeal to a New York audience. When Lincoln rose to speak, I was greatly disappointed. He was tall, tall, - oh, how tall! and so angular and awkward that I had, for an instant, a feeling of pity for so ungainly a man." His face lighted up as with an inward fire; the whole man was transfigured. I forgot his clothes, his personal appearance, and his individual peculiarities. Presently, forgetting myself, I was on my feet like the rest, yelling like a wild Indian, cheering this wonderful man. Since I have written several times about Kennedy's speech, I will focus on Lincoln's. As Lincoln's law partner William Herndon has observed Lincoln constructed the speech like a lawyer's brief. Its intent was to outline a Constitutional and moral argument against the most divisive issue of those times--slavery. 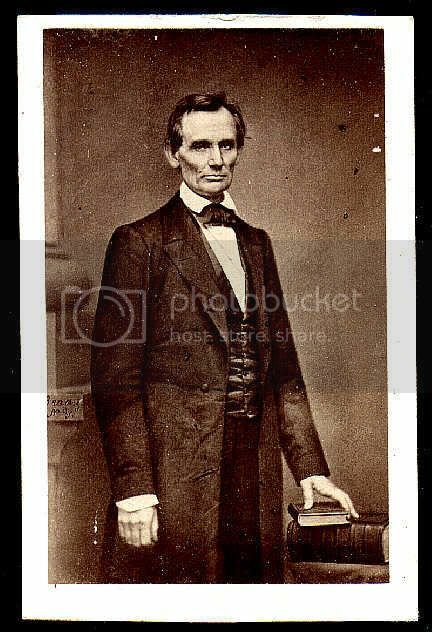 Today when politicians seek to obfuscate and triangulate any controversial issue it is noteworthy that Lincoln should take on the major issue dividing Americans and not merely discuss it, but take a clear position on it, a position that defined the differences between the two parties. One paragraph in particular leaps from that speech with relevance even for today's issues, for having framed his arguments around the opinions of the signers of the Constitution, Lincoln then had to deal with the issue of how rigidly we should follow them. His entire speech depended on how well he walked that perennial American tightrope between what high school history classes call "strict" and "loose" construction. Here in a single paragraph is exactly what Burns and Bass spoke about it. It is a statement of values, but particularly about the values that would govern Lincoln's Administration. Garry Wills has persuasively argued that the speech Obama gave on race deserves to be regarded as a modern Cooper Union speech, that Obama has already given his speech on values, but I think a closer parallel might be the 1932 election in which Franklin Roosevelt delivered the speech that defined his administration and inspired one of the great anthems of the Depression, only to then fall back into giving relatively safe speeches. FDR's "Forgotten Man" speech still stands as one of the great campaign speeches in history, yet many Americans and even the reporters covering the election were beginning to wonder if "Forgotten Man" represented only a rhetorical flourish and not a deep commitment to values. To use the language of Burns and Bass was it merely a transactional speech given for a specific tactical purpose and not a transformative one designed to move a nation. I believe Obama is now in a similar situation. Blogdom is full of rants about how he has moved the "the center" [whatever that is] and is not speaking for bloggers pet causes. People are openly wondering if Obama is not an incarnation of john Kerry and that we Democrats face yet another election in which we hold our noses and vote for a candidate we fear will not win and worry that if he does win will prove, as Bill Clinton did, merely a variation on GOP strategy. Well if you boys don’t like my speeches, why don’t you take a hand in drafting one yourselves? They took up his offer–something that today would spark a congressional investigation–producing the Oglethorpe University Commencement Address of May 22, 1932. Oglethorpe is significant in that it did not merely reaffirm what FDR had said in "Forgotten Man" it also laid out some of the main principles of what would become the New Deal. take a method and try it. If it fails, admit it frankly and try another. But above all, try something. While "Forgotten Man" came to define Roosevelt’s candidacy and become synonymous with the New Deal, Oglethorpe is important because it came at a time when people were wondering whether FDR really believed the values he had so forcefully and eloquently articulated in "Forgotten Man." Barack Obama may have given a great speech in his address on race, but currently his campaign seems to have lost its moral compass. Like FDR, Obama will need to reaffirm his values if he wants to be President, because the Republican Counterrevolution is ready to hit him with everything they have as Election Day draws closer. In these days where every word in a campaign speech is tested ahead of time with focus groups, it is easy to become cynical about the role of rhetoric in a campaign and whether it can provide a clue to those qualities Burns and Bass outlined. Roosevelt, Lincoln and Kennedy proved they can. The most obvious occasions for Obama and McCain will be the speeches delivered to their respective conventions. Those speeches should provide us a clue as to whether either of them has the potential to become the transformational leader our times demand at the White House. Amazingly, I had not heard of Bass -- thanks for bringing him to my attention. This is a fantastic piece, though I think you're a bit too easy on Obama -- my problem with him never been where his conscience lies (I'm pretty sure he has the conscience of a liberal) but where his fire resides. It certainly doesn't live in his belly, for he has shown a complete unwillingness to roast the Republican traitors who have destroyed our country. Don't get me wrong, I'm voting for the guy. But I won't become a "supporter" unless Obama shows me that he'll pursue the Bush administration to the ends of the earth to secure justice for their crimes. To date, he has indicated just the opposite. want Obama to read or at least to have a summary of to read. As a long-time student of Lincoln, I cannot recommend a better way of learning about and understanding the qualities and values that made Lincoln the very model of what we should cherish most in a President. To paraphrase the great man, I would say that "He is not educated who has not read this powerful book". Most of Bass' stuff has been published for business readers and his books, like many in that genre, run in the $50+ range. Bass actually has broken down transformational leadership into a series of qualities and along with his partners has done some serious quantitative and qualitative research into transformational leadership. His most accessible stuff can be found at the Burns Center at Maryland. As for the Lincoln book, it sounds like a must read. Thanks for the suggestion. It's on my list.